60 grit (A-2201), 120 grit (A-2202), 240 grit (A-2203), 320 grit (A-2204), 600 grit (A-2205). 2" Flap Sanding Wheels, 10,000 RPM Max Speed. 1. Use with A-69212 Short Hub when mounting discs onto Foredom Angle Grinder. These Flap Sanding Wheels are made of high-grade aluminum oxide mineral and a bonding system that reduce shelling of the mineral. These abrasives are excellent for fast clean-up and pre-polishing work. 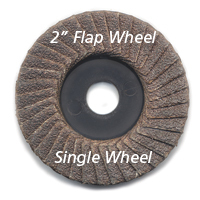 Click the button below to add the 2" Flap Sanding Wheels available grits, 60, 120, 240, 320 and 600 (Per Disc) to your wish list.